I blame Samantha Pynn. Just like that, after two back-to-back episodes of Summer Home on HGTV Canada I've got all things coastal and cottage on the brain. I look forward to sharing more info and behind the scenes about our little PEI getaway in a few months. In fact, we are close to booking our first visit of 2012. But meanwhile, I'll also fill this blog stream with all things cottage and coastal and watery and Islandy and Prince Edward Islandy and Maritimey. I posted about this ship, the almost nothing, over at the House & Home blog but it's such a beaut I think it deserves a double post (such a cheater I am). The pure whiteness of it and the way is slices through the water. Just stunning. I learned to sail once. 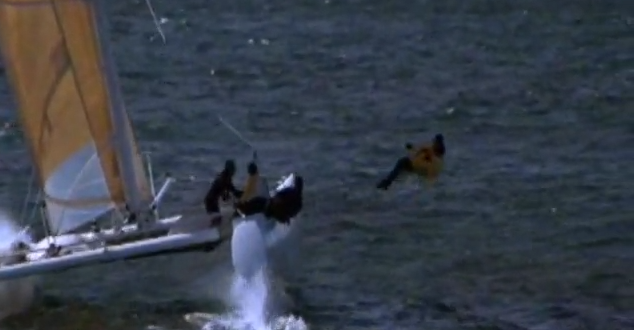 So many years ago we had a tiny 2-man boat - a Sunfish. 'Twas not even a minnow compared to this glorious thing. When my brother and I would go out on Anstruther Lake with it, he'd get it going and then let it flip over on purpose. Of course there is so much to love about sailing. Boat design yes, but also the pure posh factor. It's just so blue blood. And the clothes, the clothes. The real deal Helly Hansen gear and the ready to wear landlubber stuff -- love it all. Navy is definitely my new black. 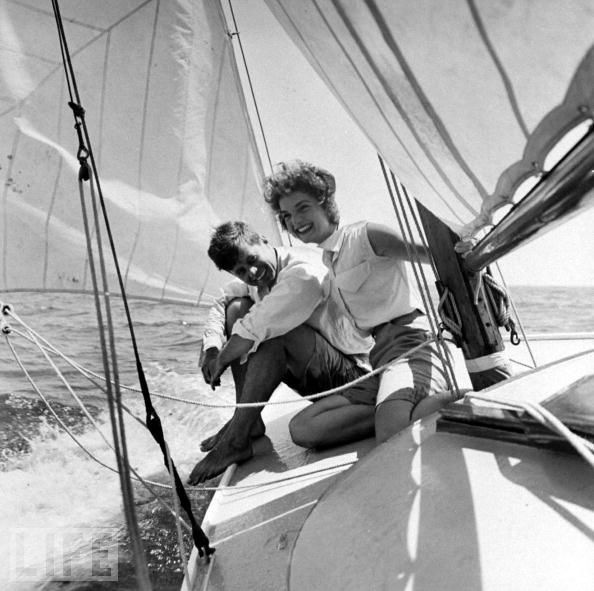 Blood doesn't get much more blue than these two - Jack and Jackie Kennedy looking gorgeous and carefree on the water. Did I ever tell you my one degree of separation from them? It's a crazy story, so even if you've heard it, I'm telling it again. This lovely older lady who was a client of Mr. A's said to him once, "If you are ever in Washington, you must come visit." Well we did visit in 2002. Turns out, the lady and her husband, a famed Washington Post journalist, were the couple who had the dinner party where Jack met Jackie. I kid you not. The couple are characters in all the bio pics. The famous scene where J and J meet and flirt over how to eat asparagus at a formal dinner party - that happened at their house. AND I STOOD IN THAT DINING ROOM! Mr. A's client was a gracious hostess. The two of them bonded over some important antique collections and she took us to the very best Georgetown shops. It was quite a trip. And speaking of blue blood. Pretty sure hers was even bluer than the Kennedys. Grace Kelly off the coast of Monaco. 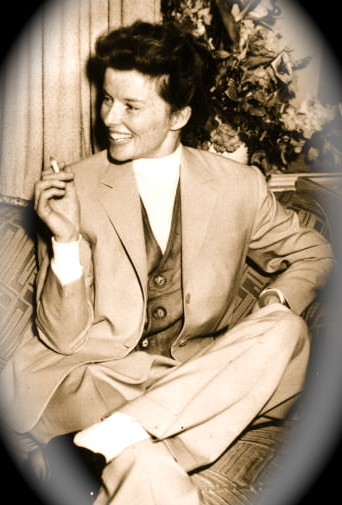 I could have sworn Katherine Hepburn was a sailing sort, but I guess golf was more her game. Though in my head I can hear her as heiress Tracy Lord in The Philadelphia Story describing her beloved yacht The True Love as "yar" Seems most of her real life "sailing" was done while crossing the ocean. Here she is on Cunard's RMS Parthia, a ship that carried only 250 first class passengers. PS. Did you know Cunard founder Samuel Cunard from from Halifax, NS? Funny story about this image. I found it on Pinterest and when I decided to post it here I set about doing some credits research. Well, turns out it's from a shoot for FASHION magazine and was shot by Gabor Jurina (whom I've met and worked with) and Susie Sheffman, whom I've also met and whose dining room is shown in the latest House & Home special issue. There goes the world being small again! The lovely model is Marie-Eve Nadeau and the story was shot off the coast of Eleuthera in the Bahamas. I found it on the Dust Jacket Attic blog. Wide leg pants and Chuck Taylors...I wish. photo credits: 1. from Plain Space by John Pawson (Phaidon, 2010) via House & Home. 2. Life magazine via Katie Armour, The Neo-Traditionalist. 3.&5. Habitually Chic. 4. Dust Jacket Attic 6. YouTube.